ANOTHER week, another blistering Woman's Day take-down. 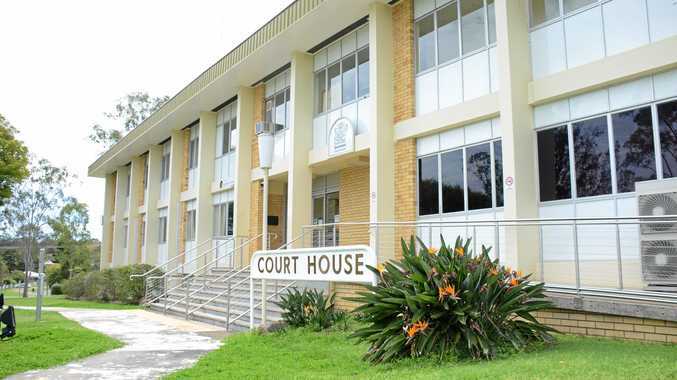 This time, the weekly Australian women's magazine, published by Bauer Media, has been taken to task on social media over its "rubbish" articles by Channel 7 television presenter and former Australian swimmer, Johanna Griggs. 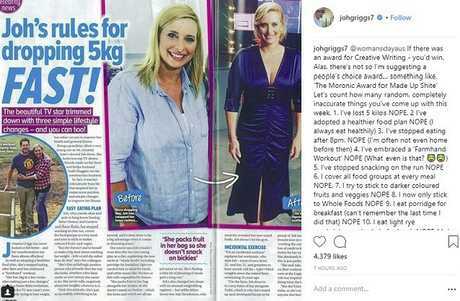 Griggs' fury comes after the glossy published an article about her titled "Joh's rules for dropping 5kg FAST!" The problem, she says, is that she hasn't lost 5kg, she never revealed any weight-loss secrets to Woman's Day, and she doesn't even follow the secrets they claim are hers in the article - and doesn't even know what they mean in some cases. Joh Griggs says Woman’s Day deserves an award for “The Moronic Award for Made Up Shite”. "Let's count how many random, completely inaccurate things you've come up with this week," she says in the post, alongside an image of the offending article, which shows a picture of Griggs, 44, in a casual, loose-fitting shirt as a "before" comparison and a picture of her in a form-fitting formal dress as an "after" comparison. "I've lost 5 kilos. NOPE," she fumes. "I've stopped eating after 8pm, NOPE (I'm often not even home before then) … I've embraced a 'Farmhand Workout', NOPE (What even is that?)" She continues: "I eat porridge for breakfast (can't remember the last time I did that), NOPE … I eat light rye sandwiches and salads for lunch, NOPE … I pack fruit in my bag so I stop snacking on biscuits on set - again - that would be a NO." She lists a whopping 14 made-up "rules" that Woman's Day claims she abides by. But in fact, she wrote, the only weight-loss "rules" she does do in real life are the two the magazine claims she doesn't. "Funnily enough the last two things you say I don't do - I actually do - so by my calculations you have managed to write an entire article that is 100% inaccurate." This is the second time in a week the women's magazine has been publicly lambasted by a television presenter. Last week, Today show co-host Karl Stefanovic blasted the magazine for printing false stories and being "bullies". "Another week another BS cover. Enough is enough," Stefanovic, 43, wrote on Instagram, alongside a picture of the latest cover, featuring him and fiance Jasmine Yarbrough, which suggested his bosses at Channel 9 banned Yarbrough from walking the Logies red carpet with him.